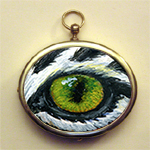 Our Limited Edition Wildlife Eye Pendants feature an original, hand-painted wildlife eye on porcelain mounted in a gold-plated pendant. Available exclusively at EyeHelpAnimals.com and in limited quantities. Each of our Wildlife Eye Pendants is numbered and comes with a Certificate of Authenticity signed by DJ Geribo, the artist and cofounder of Eye Help Animals. We now have a Black Onyx Wildlife Eye Pendant that matches our Black Onyx Wildlife Eye Earrings!